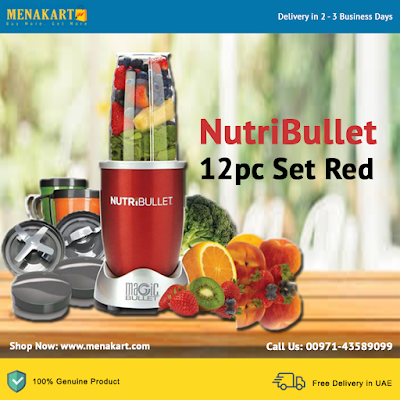 The red colored MB NutriBullet 12 Piece Set has quite a few redeeming features that make it a popular choice when looking for a blender. It can make everything from smoothies to superfoods like spinach, berries, and beets. The NutriBullet has an easy to use design, and its controls are very straightforward, which makes it even more user friendly. As it sports a compact body, it becomes easy to store or leave on the kitchen platform. It comprises of a powerful 600W motor, cups that are washable, lids that fit the cups securely, and stainless steel blades that are sharp. The blender includes a recipe book as well, which is helpful for those you want to start making smoothies right away. Live a strong, healthy life by creating yummy, delicious smoothies and other extracts with this excellent MB NutriBullet high speed blender.